Those were the opening lines of the first public statement by the National Liberation Zapatista Army (EZLN), published on the day of the uprising on Jan. 1, 1994, when the North American Free Trade Agreement (NAFTA) came into effect. The agreement drove the United States, Canada and Mexico into a commercial zone that has since impoverished the poor while making the bourgeoisie even richer. In that first statement, the EZLN announced they would walk into Mexico City and defeat the national military, inviting people to rise up and join them in the fight. Since then, the Zapatista’s have become an incredible political force, inspiring the international revolutionary movement, setting a new standard for revolutionary action, and drawing in large section of Mexican society to emancipatory politics. Since the insurrection, the Zapatista’s have focused less on armed struggle and more on building a political support network that is nationally expansive in Mexico, while maintaining an autonomous region in Chiapas that is no longer dependent on the state. As Mexico welcomes a new left leaning president, Andres Manuel Lopez Obrador, the Zapatista’s have issued a stern warning. 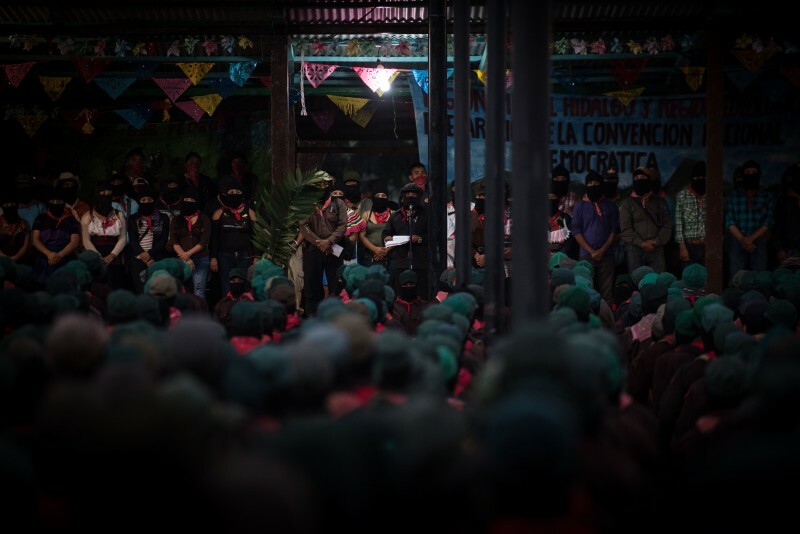 Zapatista supporters had been at Guadalupe Tepeyac, part of the autonomous territories, along with members and representatives of the EZLN and support bases discussing future steps in the anticapitalist revolutionary struggle. The government of Lopez Obrador proposed the creation of the National Guard, a 50,000-strong security force that will be trained and commanded by the military to carry out public security duties. Detractors describe it as a move to perpetuate and legalize militarization in the country. The Zapatista movement has always been at odds with Lopez Obrador. Since the first time he ran for president in 2006, the EZLN organized an alternative campaign and declared its opposition to the leftist candidate. Now, with its landslide victory in the 2018 elections, the Zapatistas have reiterated their position. The Maya Train is a large-scale infrastructure project proposed by Lopez Obrador to connect the whole Yucatan Peninsula for tourism, transportation and economic purposes. “Everything we’ve built, we’ve carried it ourselves. There are solidarity sisters and brothers that have helped us, but it’s not easy to face political parties and bad governments are the current one: dishonest and deceitful. The Zapatista’s are now poised to be rekindle revolutionary momentum from an anti-state perspective. Particularly since Obrador seems keen on appealing to US imperialism. As the contradictions inherent in fascism, democracy, capitalism and the nation-state project are colliding, the Zapatista project, twenty five years active now, may just be at its inception.